April marches on, and so does the Dungeonstack! Since today is #MonsterMonday, I thought it only appropriate to post something...well, monstrous. Just print at 2.75x3.75" and cut on dotted lines. The top of the card has Hit Dice and name, and the bottom holds all the important combat stats (shifted down from just below the picture on the hero cards). 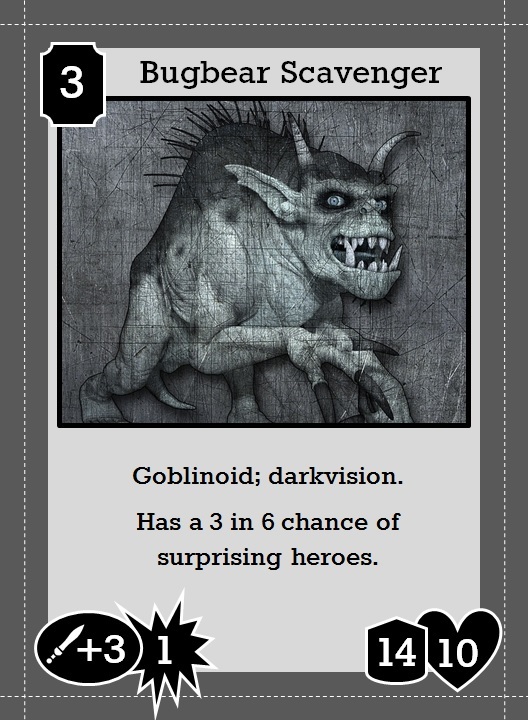 Based on typical old-school monster presentation, I know I could get away with not having the attack bonus listed...and probably hit points, for that matter...but I liked the consistency with the hero card. And yeah...I realize that's probably not really a bugbear in the art, but I think it looks like it could be pretty close...even with the horns. If you're a stickler for that kind of thing...accurate portrayal of bugbears and all...well, sorry! Looks good, sir. I curious to see what other critters will be encountered. I knew you BJWs (that's Bugbear Justice Warriors, y'know) would start coming out of the woodwork! That made me laugh more than I think it should have. Well played. Also, I gave you a shout out in my B post.